I was talking to a woman that contacted me to learn the passap machine. She was telling me that a knitting guild she belonged to had a knitting challenge doing any machine knitted item that was short rowed. She told me a woman in the guild made the most beautiful scarf and that she wanted to try it. She found the pattern and I liked it and bought it . I used a yarn that has the feel of perla. It is a thin yarn and the variegated yarn was even thinner. I did not crochet around the scarf when I was done. I used the “worm” edging . The worm edging is on you tube by Kate Winslow. The edge still curls a little bit but I think it is okay. 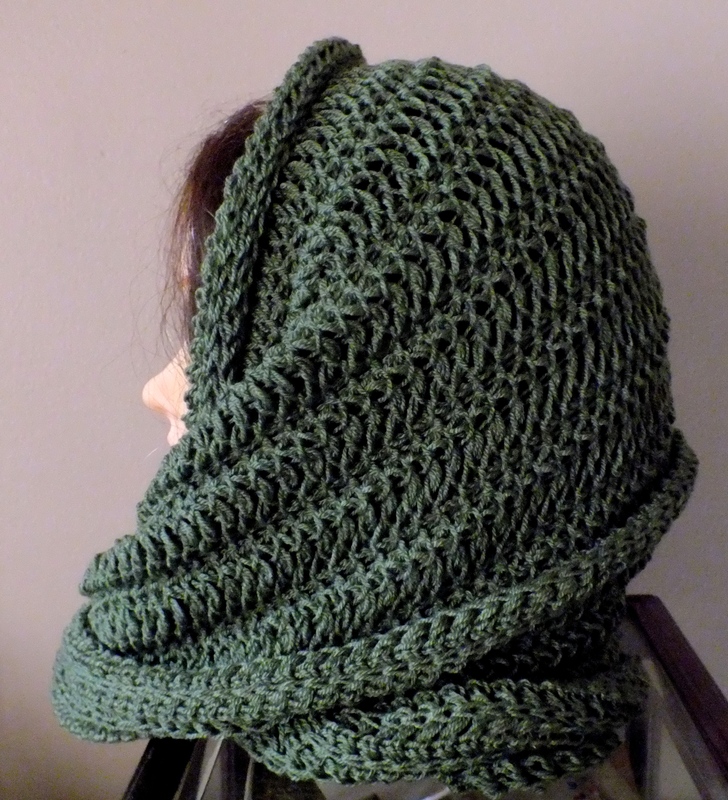 How can something that looks so hard to knit be so easy? 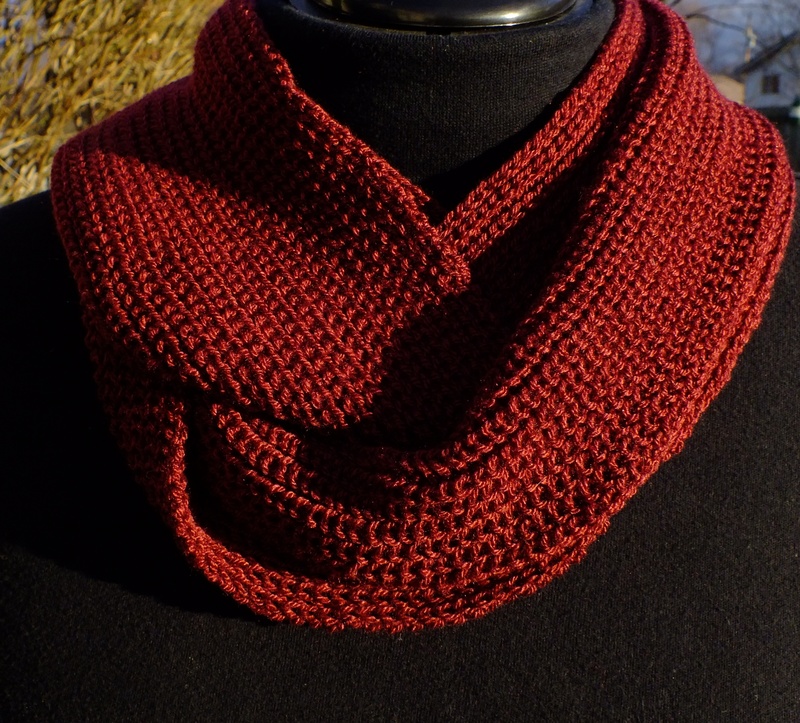 Somewhere on a knitting machine site I saw a red scarf knitted with this technique and it was beautiful. Reference was made to the technique used being from the John Allen book called The Machine Knitting Book. 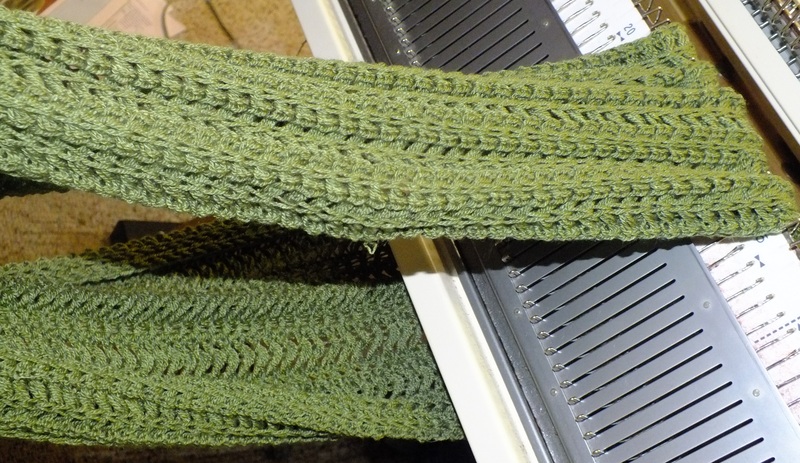 I also saw it called the wave on a Facebook knitting machine group. I had a small ball of yarn sitting around and decided to use it up. It might be acrylic with mohair or wool with mohair. I know it feels scratchy around my neck but I wanted it for around a coat collar. I had this knit in less than a half hour on my Brother 940. Once I got into the rhythm , there was no stopping me. 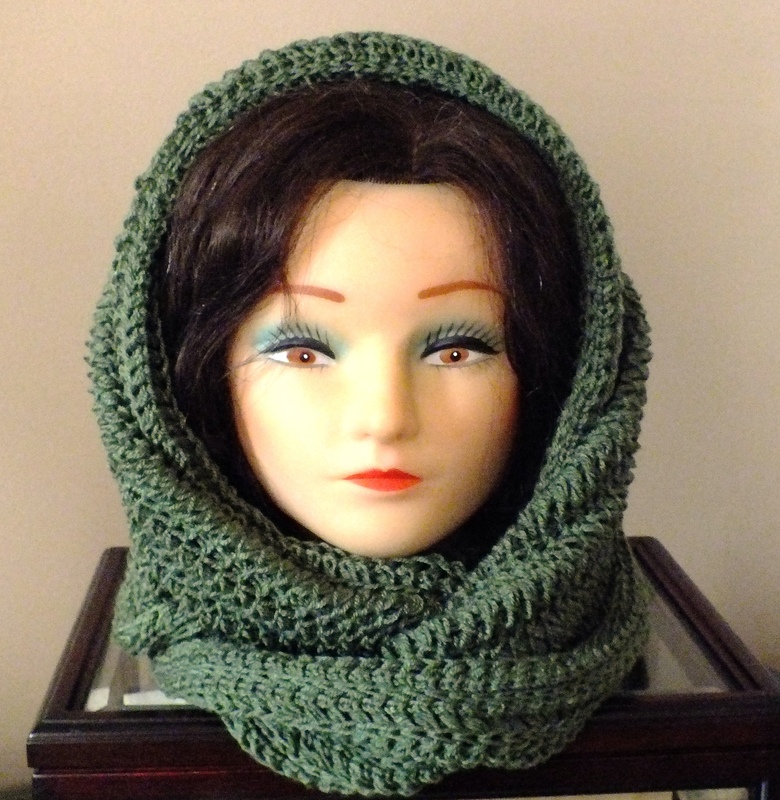 I did not want to crochet all the way around the scarf like the woman does in the video. I like the way it curls in and I don’t want to steam it flat. I like narrow scarves. I used seven sets of 4 needles. This video is excellent even though it is not in english. If you look closely at the top picture , you will see seven strands of yarn between the sets of four. If you have more or less , you will know you made a mistake. I even like the wavy edges when it is finished. Here is the link to the video I followed. I hope you give it a try since it was a lot of fun to do. I love, love, love, the new yarn called Woolike at Michaels Store. It is so soft and really drapes nicely. When you knit with it you don’t have to rewind the skein. Take the strand out of the middle and it feeds nicely while knitting. I decided to try some tuck stitch patterns on my electronic bulky to see if anything looked good on both sides. I did several of the patterns in the book but I like this one a lot. It looks good on both sides. It is pattern 129. 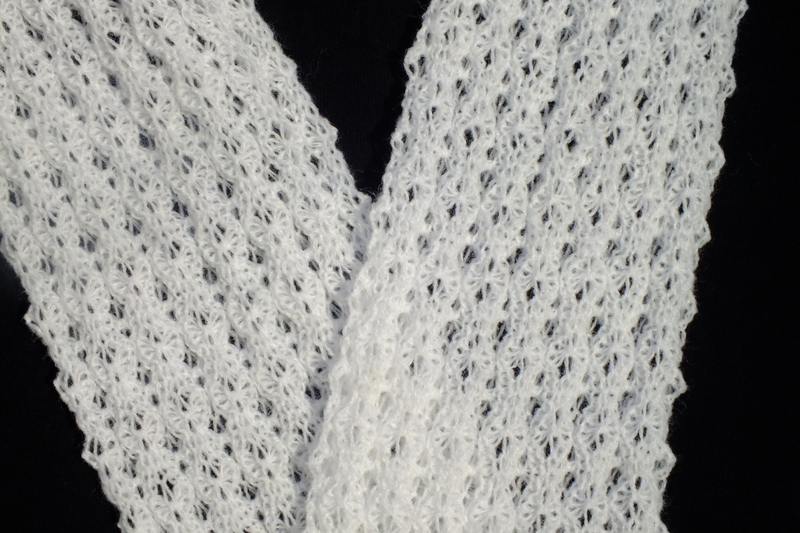 If you use the tuck stitch side you will see more loops of texture. 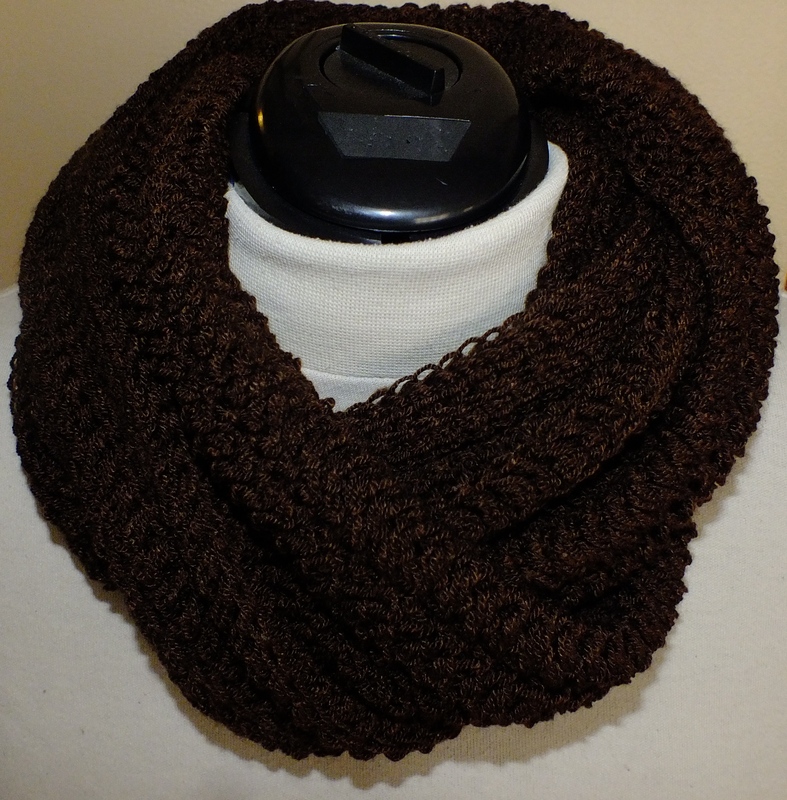 The edge stitches look nice and roll a little but that is a good thing with this scarf. 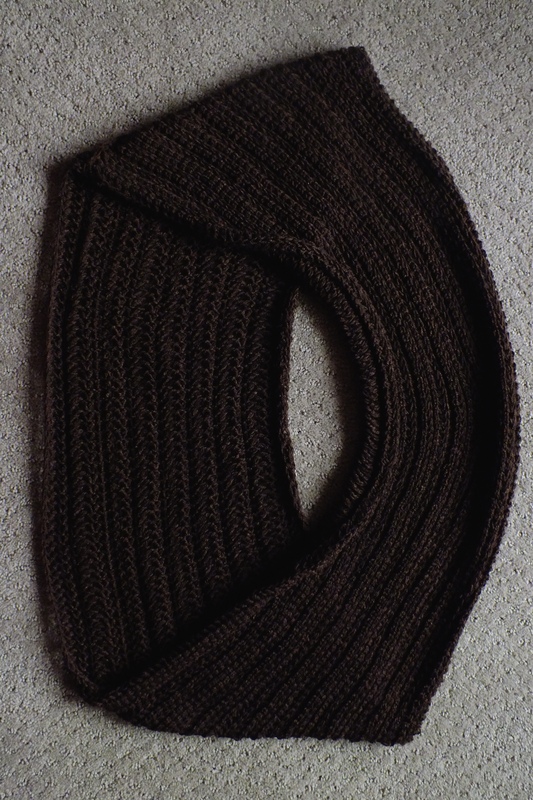 I knitted 560 rows to get approximately 50 inches. Then I connected the beginning to the end to make a circle. To put it on, I folded the scarf in half and put around my neck. Then I took the bottom part and turned it like a figure eight and put that loop over my head. 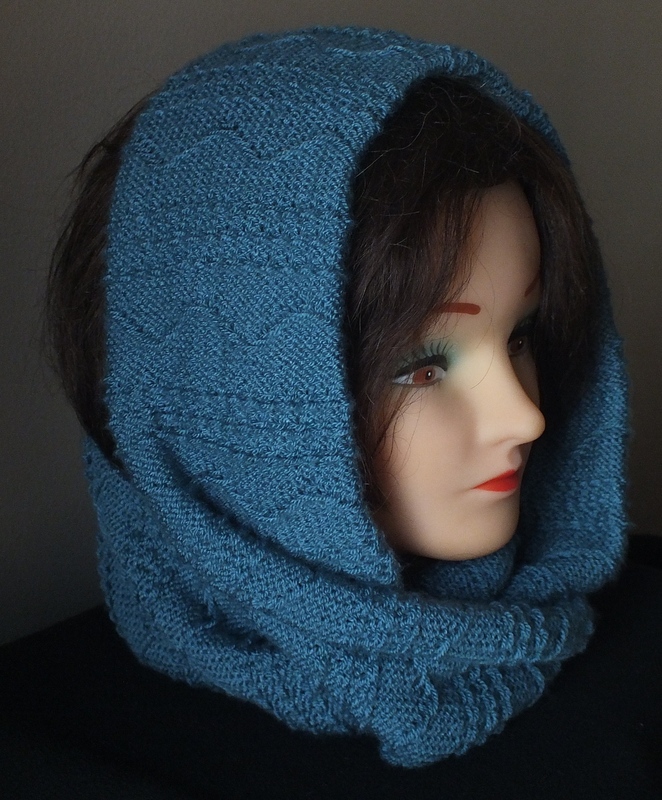 It feels wonderful and I think it looks a lot like the Bulky cowls people like without all the “bulk”. 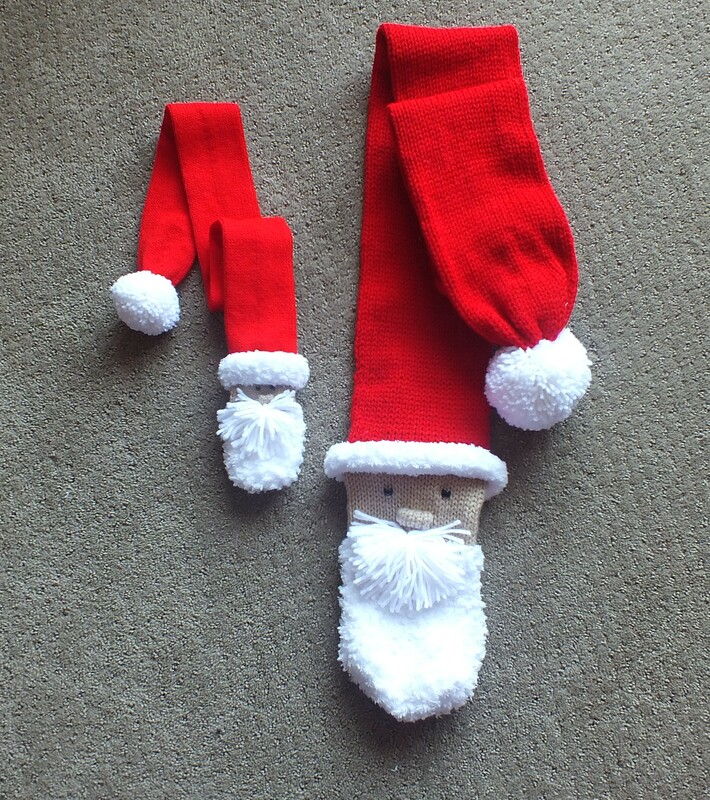 My girlfriends’ grand daughter asked her if she would make her a scarf that wrapped around the neck several times. My girlfriend Sheila came up with this and told me I could share it with you. It is done on the Passap E 6000 using technique 112 which is Fisherman’s rib. The settings are EX/KX. Pushers on the front bed only. I set up 17 working needles (Every Other Needle) on both beds. I used a cast on tension of 4, CX/CX tension 5 and N/N row tension 6. Then changed to 7…/7… on both beds and knitted 800 rows. The mast tension was 5.5 on the first mast. My girlfriend used a different yarn 2/17 I believe it was and she cast on 21-0-21 on both beds with a tension of 5. She knitted 800 rows also. The scarf is 88 inches long and can be longer if you want it to fall further down on your chest. Every time you wrap this scarf (3 times) it looks different but very nice. It is soft and does not feel like it is smothering you. I found a yarn at Michaels store that I never saw before. It is called Woolike by Loops and Threads. It is 3.5 ounces and 678 yards. 85% acrylic and 15% nylon. It is $2.99 but it is on sale now for $1.99. 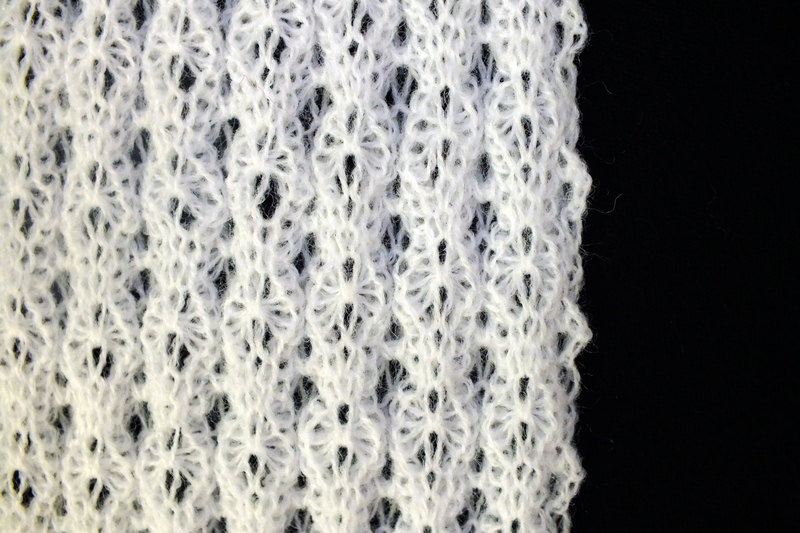 What a great price for a thin yarn that can be used on our knitting machines. 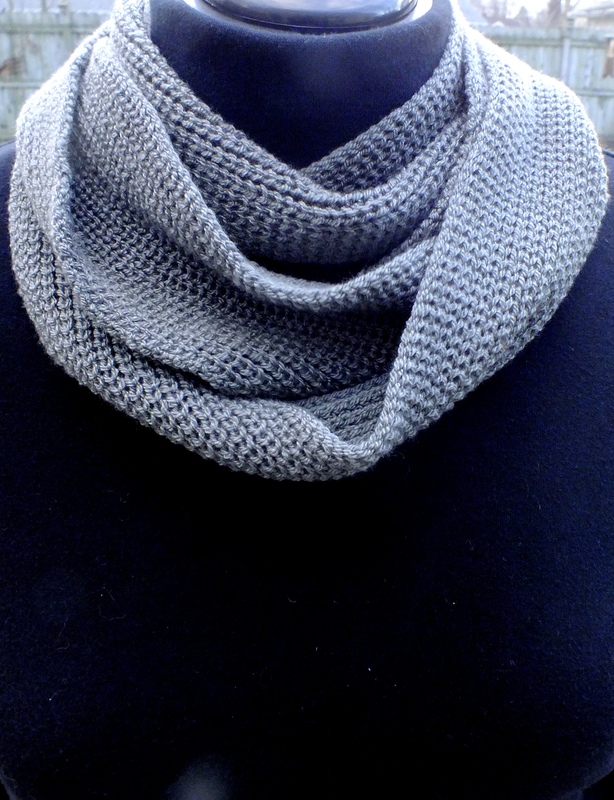 It feels soft and knits nicely on the passap. 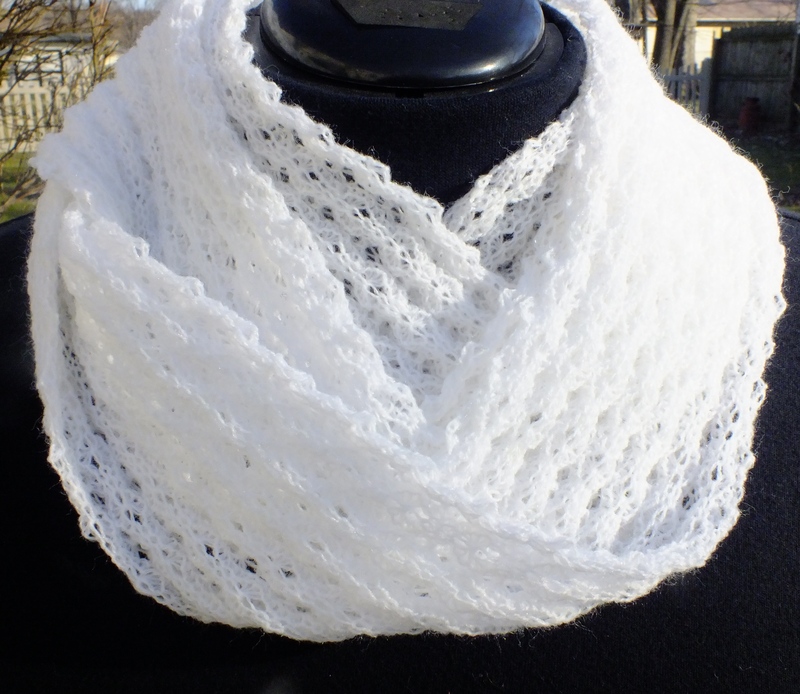 You can even go lower on the tension but this scarf I wanted nice and airy. I just sewed the seam with a weaving because it will not show once you wrap the scarf three times around your neck. One skein was enough to knit 800 rows with yarn leftover. You can use one strand of 2/24 also. Here is a detailed pattern if you need it at my drop box. I had to buy some purple yarn for a flower order I had. So when I used the yarn for them I wondered what I was going to do with the rest of the yarn. The yarn is called Impeccable by Loops & Threads. It is 100% acrylic but it looks like wool. 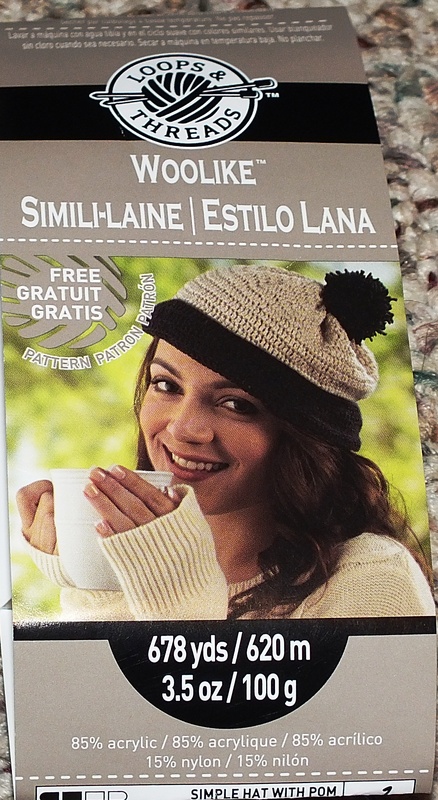 I was surprised to see that the skein was 4.5 ounces. It was on sale for 50% off which came to $2.50. 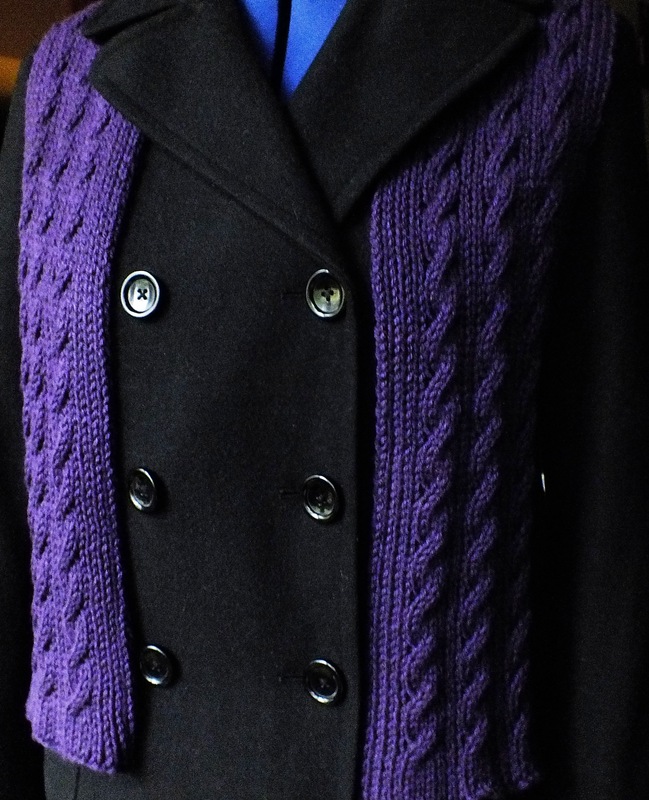 Well my sister loves purple so I just decided to use a pattern I had made up before for Paton’s lace yarn. The set up was the same with the needles but I used a tension of 7 on both beds instead of five. I used the cast on comb and two weights for this yarn. I just cast on and knit until I came to the end of the yarn. 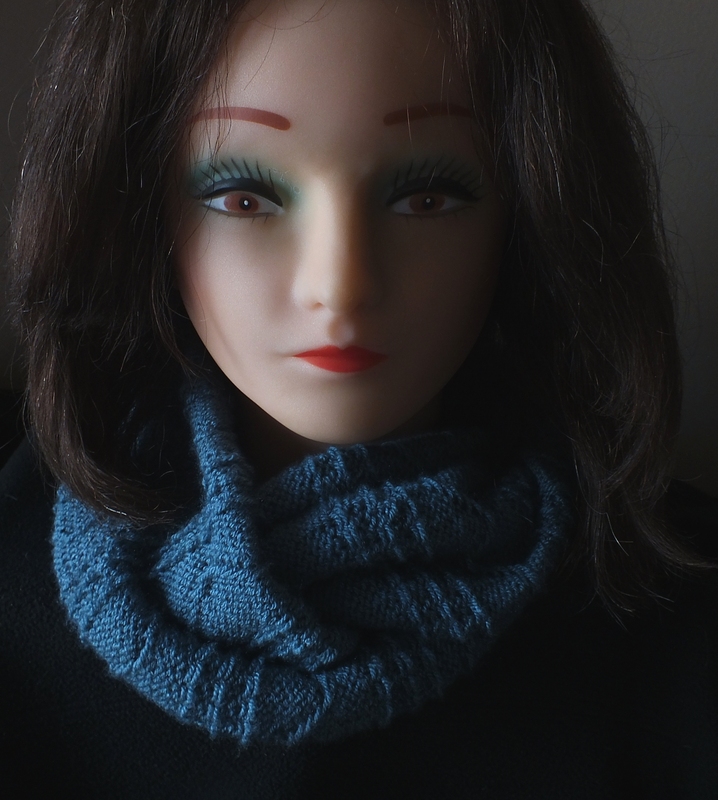 I ended up knitting 273 rows instead of 310 but it is a nice length. I don’t know that I ever offered the pattern. 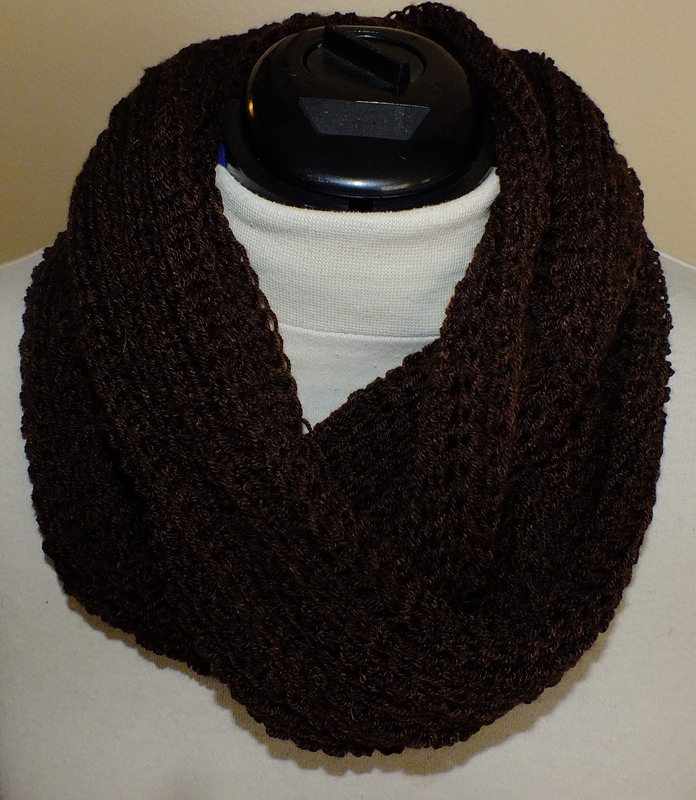 Here is the link if you want to make some nice last minute scarves. You can make this on any machine setting up your needles. Any yarn also, except increase the number of stitches if you use a finer yarn.